﻿ Ludogorets 1-2 Real Madrid. Tougher to crack than expected! 01.10.2014 » Ludogorets 1-2 Real Madrid. Tougher to crack than expected! Tonight's visit to Bulgaria proved to be more difficult than many had anticipated. Real Madrid brought the 3 points back to Spain after defeating Ludogorets Razgrad through a 1-2 win, but the hosts showed a great resilient spirit during the whole game and despite the loss, they certainly didn't let their fans down. The Bulgarians would even be the first to score this Wednesday night, which ended up forcing the Merengues to really get themselves dirty during their chase of a positive result. Cristiano Ronaldo equalized the tie close to the midpoint of the first half, but the comeback only got completed later in the second half, when Karim Benzema finished off a good cross from Marcelo that came from the left. In the other game of the group, Liverpool surprisingly lost 1-0 to Basel in Switzerland, leaving a big question mark about who is in better position to follow Real Madrid into the last-16 stage of the UEFA Champions League. Ancelotti made a few changes to his side tonight, bringing into the starting lineup the likes of Arbeloa (Carvajal), Illarramendi (Kroos), Isco (James Rodríguez) and Javier Hernández (Benzema). 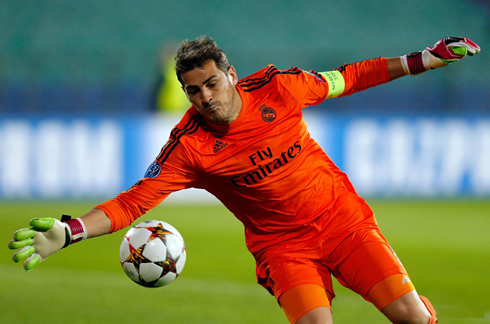 Iker Casillas kept his spot in goal, with Marcelo, Varane and Sergio Ramos joining Arbeloa to complete the back-four. The midfield was populated by Illarra, Modric and Isco, while in the attack, Chicharito made his first debut ever as a starter while wearing a Real Madrid jersey, and he did it next to the team's heavyweights, Cristiano Ronaldo and Gareth Bale. However and against all odds, it would be Ludogorets Razgrad who got to break the deadlock at the Vasil Levski National Stadium. The hosts made Real Madrid pay from their lack of focus around the 6th minute of the first half and they've done it by exploiting one of the Spanish giants' biggest weaknesses, the defensive corner-kicks. The Bulgarians had the ball being crossed to the near post, where Cosmin Moti rose to head it back into the far post and past everyone, allowing Marcelinho to finally head it into an empty net without any sort of trouble. Ludogorets were in front and the home fans naturally went crazy. 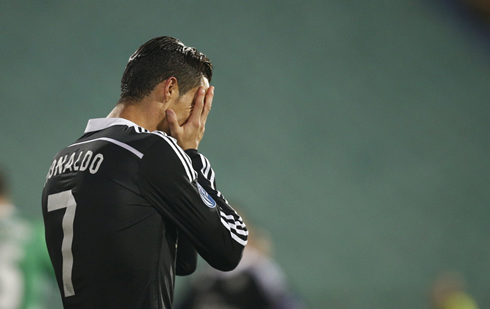 Five minutes after Ludogorets' opener, Real Madrid earned a great chance to tie things up in Sofia. Luka Modric found Chicharito escaping the hosts' marking in the centre corridor and the former Manchester United forward managed to reach the ball before his opponent's sliding tackle, allowing him to draw the foul inside the box. Cristiano Ronaldo called upon himself the responsibility of taking the penalty-kick, but unfortunately, he ended up seeing his shot being brilliantly saved by Vladislav Stoyanov. It may not have gone his way the first time, but once the referee pointed to the spot 15 minutes later, Ronaldo didn't hesitate to step up again and redeem himself from the earlier miss. It was the Portuguese star 69th goal in the Champions League, which now puts him only 2 goals behind Raúl's all-time record of 71 goals. Those thinking that once the draw was obtained things would get a lot easier for Real Madrid, probably had another surprise when they saw Ludogorets hanging on to the 1-1 roughly until we entered the last quarter of an hour of the game. It was only then that the Merengues finally dealt the finally blow, when Marcelo's cross from the left found Karim Benzema free from marking inside the box and just a few meters away from goal. The Frenchman, who had come in to replace Chicharito just 10 minutes before, didn't miss his great chance to put Real Madrid in front and buried his second goal in the competition with a left-foot strike. At the end of the game, Cristiano Ronaldo had to be assisted after suffering a knock to his ankle, which ended up forcing him to leave the pitch limping a bit when the referee blew the final whistle. Shortly after the game was over, it would be Ronaldo himself assuring the journalists that there shouldn't be any reasons to worry much about this small injury, since he believes in already being fully recovered from it over the next days. Real Madrid are now on top of the UEFA Champions League Group B standings with 6 points, holding a perfect record of 2 games and 2 wins. Liverpool and FC Basel are tied in second place both with 3 points, while Ludogorets Razgrad is still last and without having earned a single point yet. Attackers: Bale, Cristiano Ronaldo, Javier Hernández.